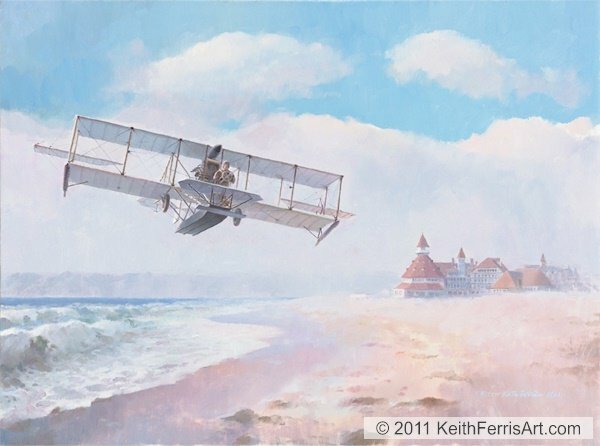 Symbolizing the rise of Naval Aviation, Naval aviator #1, Lieutenant Theodore “Spuds” Ellyson, is seen flying Naval Aircraft #1, the Curtiss A-1, as he crosses the Silver Strand below historic Hotel Del Coronado, Coronado, California in August of 1911. The A-1 was a military development of the first seaplane to fly in this country. With the addition of another first, the retractable landing gear, this first U.S. Naval aircraft became the amphibian “Triad”, the first aircraft able to operate from land, sea or air.